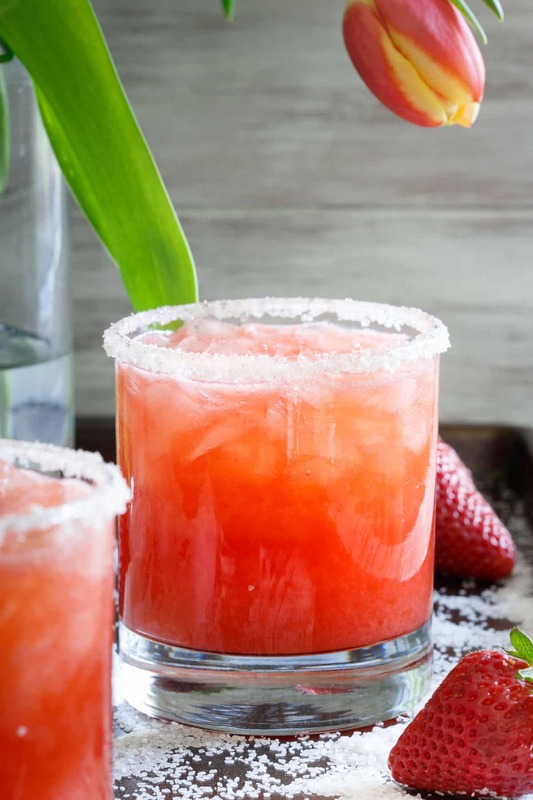 This salty dog cocktail recipe adds fresh strawberries for a spring twist to this classic drink. Perfect for Cinco de Mayo if tequila isn’t your thing! Raise your hand high if you’ve had an “incident” with tequila. Oh, hi, me over here, standing on tippy toes raising hand. The scene: my 21st birthday. The outcome: the Carlisle, PA ER. It wasn’t pretty. Or so I’ve been told since 13 years later I still have zero recollection of 3 hours from that night. So while I know tomorrow is all about the tequila and guac, I totally get it if one of those things is just not your cup of tea (and I’m not talking about the guac, not liking that is just plain weird). Unless it’s a really good margarita, the thought of tequila usually makes me squirm. That changed a little last week though when I was in Mexico at the Cancun Wine and Food Festival and we did a tequila tasting at one of the restaurants in the host hotel, Grand Fiesta Americana Coral Beach (a lovely place to stay in the area with the best spa I’ve ever been to in my life). Apparently, we’re all doing this tequila thing wrong. It’s not about throwing it back, licking some salt and squeezing a lime wedge into your mouth. It’s all about sipping and breathing correctly. I will say, now that I know how to properly do a shot of tequila, it tastes way better than what I remember from that horrible night spent celebrating legal-dom. And, all these years I spent thinking white (blanco) tequila was the way to go, the tasting made me realize I actually much prefer a nice anejo. These mango coconut margaritas or this serrano cucumber margarita make great Cinco de Mayo options as well! Rather eat your booze? Try these coconut cilantro margarita ice pops instead. All that said, it’s still not quite my alcohol of choice for mixed drinks. 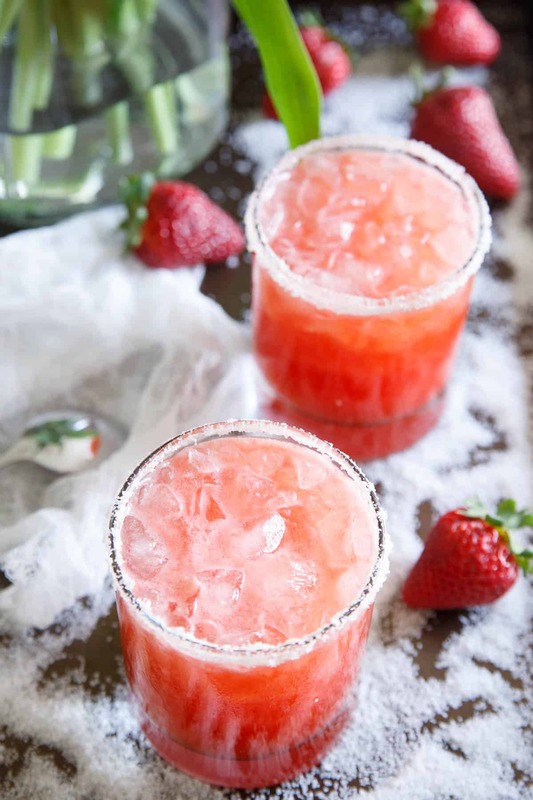 Good old vodka wins that one and that’s just what this strawberry salty dog calls for. What’s In A Salty Dog? The classic salty dog cocktail combines vodka and grapefruit juice with a nice salty rim. It’s this brilliant contrast of sour and salty and it works deliciously well. Being that we’re smack in the middle of strawberry season though, I decided it needed a spring twist with the addition of some fresh strawberry juice. I used my juicer but if you don’t have one, just throw some in a blender, that’ll work just as well. So if your hand was raised to the sky on the tequila hate train, I get it. 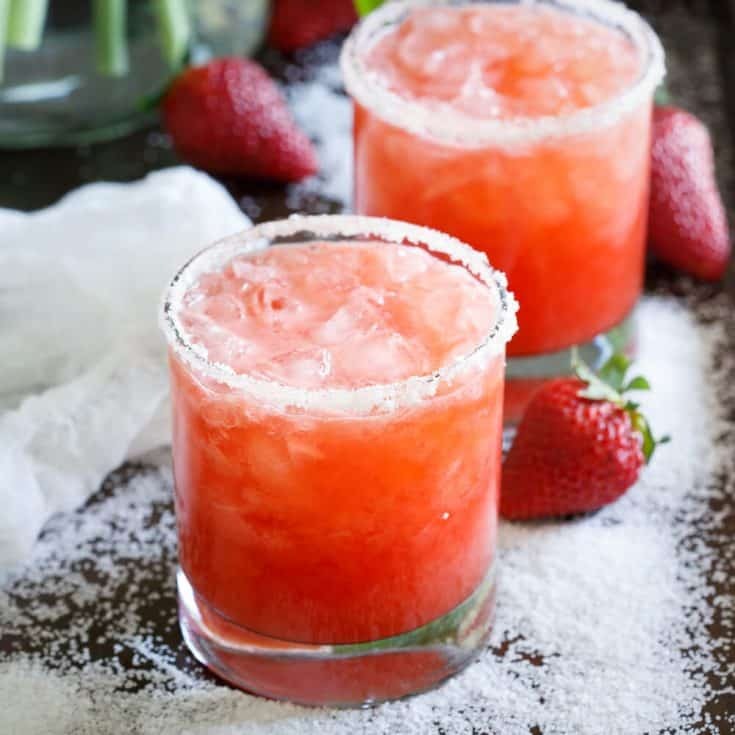 Enjoy one of these strawberry salty dogs for Cinco de Mayo instead. The guac won’t know any better. 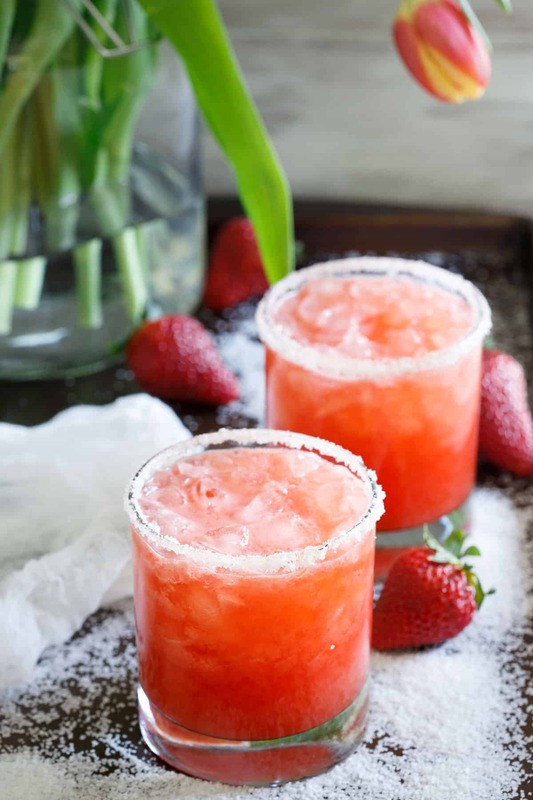 This salty dog cocktail recipe adds fresh strawberries for a spring twist to this classic drink. Wet the rim of two glasses. Place salt in a small dish and dip rim into salt until coated all the way around. Combine juices and vodka in a cocktail shaker with ice. Shake until chilled. Strain and pour into salt rimmed glasses. Oh wow, this looks fantastic! I am definitely going to try this the next time I make a drink! Well it wasn’t tequila, but rum that did me in..or possibly all the sugar since it was one of those yard long daiquiri drinks you get in Vegas and walk around with all night like an idiot. Anyways, vodka is my booze of choice these days and I’m loving the strawberry salty dog, can’t wait to give it a try! This looks so tasty! A perfect drink for warm weather if it ever arrives! Ugh, for real. This weather is horrific! aaah, yes. The “tequila incident” of 1994 involved way too many shots, and not being able to handle my booze, and it … making its exit via my nose. Even the smell now … well, it isn’t pretty. I think I’ve had more “incidents” with vodka than tequila. LOL. But yes, as you get older, you learn to not only drink it more appropriately, but to also not drink that bottom shelf well stuff that will surely make you sick. ;) This drink sounds fabulous–a great way to round out all the margaritas that will be going around! Oh, Yes! This has my name all over it! So pretty too! Ole! I am so with you and Tequila. No ER visit, but one margarita and I don’t remember my name! I am loving this salty dog–so making it!